Ian Manzi ’18 was at his high school in Rwanda five years ago when “serendipity struck” and changed his life. Manzi will graduate with a bachelor’s degree in economics, and his time at Rochester has gone exceedingly well. 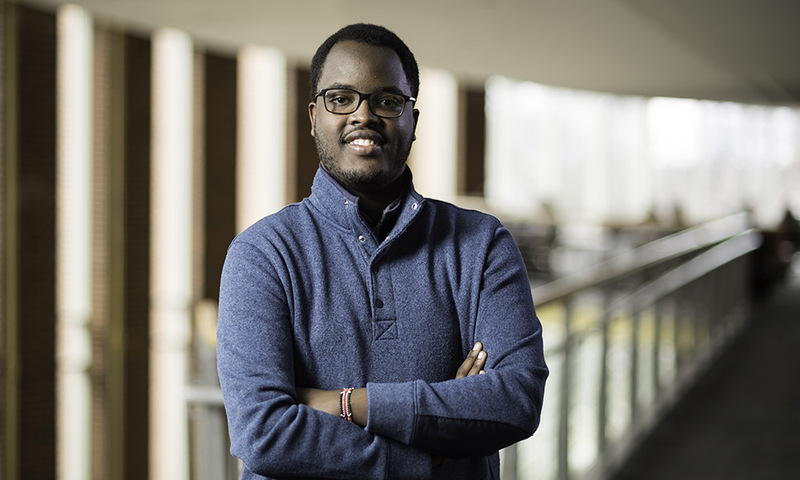 He was part of a team with Derrick Murekezi ’19 that won a $10,000 Davis Projects for Peace Grant in 2016 for their work in creating a summer peace camp for young leaders in Rwanda. He coordinated an Amazon.com wish list of 77 books for students in a youth village in his native land. And he has made his mark on the River Campus as a member of the Pan-African Students Association, the University of Rochester Christian Fellowship, and International Student Mentors, and as an employee of the Paul J. Burgett Intercultural Center, the Language Center, and the Barbara J. Burger iZone. He also speaks four languages: English, French, Spanish, and Kinyarwanda—the official language of Rwanda. He was born a year and a half after the 1994 genocide in Rwanda, a mass slaughter of more than 800,000 Tutsi and moderate Hutus citizens by members of the Hutu government. Manzi lost family members in the atrocity, including his great grandfather, and says that while he was growing up, “the impact was still visible.” It’s a huge reason he and Murekezi created their summer youth peace camp, where campers reflect on the genocide and discuss ways to avoid something like that ever happening again. The July camp is held in the Rwamagana District in the Eastern Province of Rwanda. Plans for their third annual camp, in July, are under way. He will stay at the University this fall, taking a few classes at the Warner School of Education before heading home for a year of family, projects that support his community, and professional development. Manzi is grateful he discovered the University that day in Rwanda five years ago.